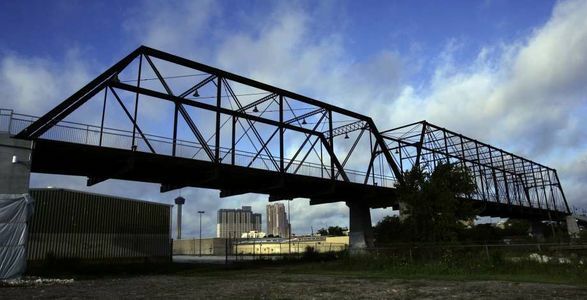 The Hays Street Bridge is recognized as a Texas Engineering Landmark and is on The National Register of Historic Places. It is also recognized by the citizens of San Antonio as a favored destination, meeting place and observation platform. Envisioned as a component of a hike and bike trail linking the Central Business District with neighborhoods to the east, the Bridge was restored and reopened in 2010 after years of work by San Antonio residents, with funds contributed by the Federal Government, the City, and local individuals and organizations. Yet in the seven years since its reopening, the City has blocked efforts to make the Bridge fully available to the public, including efforts to provide restroom facilities, parking areas for cars and buses, and other amenities addressing the needs of its vast number of bicycling and pedestrian users. Instead, through back room meetings, the City has encouraged private commercial interests to plan for their private, profit-making use of the Bridge, to be implemented in the near future. If these plans are carried out, the City will effectively surrender the Bridge to the whims of private commercial interests, robbing the public of this priceless historic and cultural resource. Updated, accurate, durable and user friendly displays explaining the Bridge’s historical, cultural, and engineering significance. PLEASE INCLUDE YOUR ZIP CODE AND/OR COUNCIL DISTRICT IN THE "WHY IS THIS IMPORTANT TO YOU?" SECTION. Thank you all for signing this petition! Some exciting news we have is that the Texas Supreme Court decided to take on the Hays St. Bridge case! Visit (esperanzacenter.org/esperanza-projects/hays-street-bridge-restoration-group) for more info on what this means! In addition, we are currently running a photo contest to raise awareness of the view of Hays St. Bridge from the corner Cherry & Lamar. Visit (esperanzacenter.org/event/corner-of-cherry-lamar-photography-contest) for more info! The next Historic Design and Review Committee meeting to determine the design of the planned luxury condo apartment building on 803 N. Cherry st is on the agenda for Dec. 6th @ 1901 S. Alamo St. Arrive before 3pm to sign up to speak out against these and future plans of development around the Hays St Bridge. Now, we need your voices heard in the Historic & Design Review Commission (HDRC) Tomorrow, Wednesday, Sept 6th at 3pm at 1901 S. Alamo St. Get there early to sign up to speak out about the threat of privatization to the bridge and surrounding areas and demand a need for public space and amenities like restrooms, off-street parking, water fountains, and bicycle fix-stations. Show up in bicycle gear to represent the bicycling community.